Twyla June White, 89, of Amsterdam, OH, joined the angels in heaven on August 16, 2018 surrounded by her loving family. She was born August 29, 1928 in Bloomingdale, OH, a daughter of the late Lawrence "Tex" and Anna (Smith) Hoobler. Twyla was a member of the Hope Church in Amsterdam, OH where she sang in the quartet and served on the board. 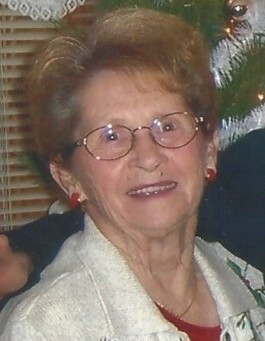 She loved and performed country music including guitar, bass, and piano. Twyla played in a country band with her husband, Dean. Twyla and Dean were soulmates. They loved hunting ginseng and mushrooms. She loved watching the deer in her backyard and would feed the âchippiesã with peanuts on her front porch. In addition to her parents she is preceded in death by her husband, Mervin Dean White; son-in-law, Floyd Grimes; siblings, Bud, Alfred, Lois, and Norma. Twyla is survived by her children, Kenneth L. (Sandy) Dorsey, Sr., Linda Grimes, Clifford (Cindy) Dorsey, Barbara (Doug) Merrin, and Carol (Butch) Laneve; siblings, Gloria Wilson, Sylvia Sheets, Howard Hoobler, and Dennis Hoobler; 11 grandchildren; 22 great grandchildren; and 1 great-great-grandson. The family would like to extend a special thanks to Kim, Mary, Lizzy, Katrinka, Tonnie, and Valley Hospice for their care and kindness. Friends will be received on Sunday from 2-4 and 6-8 p.m at the Everhart- Bove Funeral Home, 110 W. Main St., Richmond and again on Monday from 10 a.m. until time of funeral services at 11 a.m. with Pastor Tom Chain officiating. Burial will follow at Bergholz Cemetery.